Are bicyclists about to lose their place on Entrada Drive? 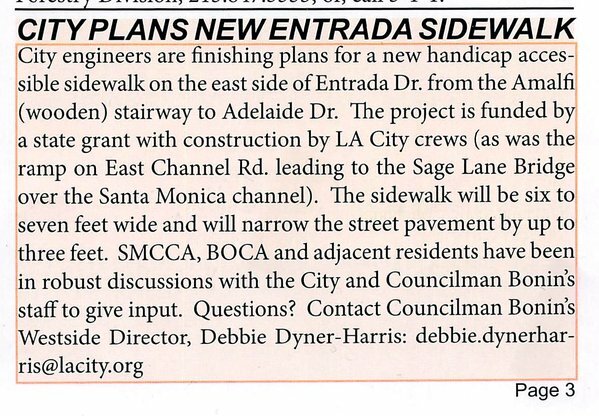 Cyclist Guy Seay forwards notice of a plan to install a much needed sidewalk on Entrada Drive as it winds along the hillside between Santa Monica and Los Angeles on its way to the coast. But as he points out, the plan calls for narrowing the roadway three feet, potentially taking up the excess space that keeps slow moving riders — as shown in this short video — from having to take the lane in front of drivers headed up the short, steep hill. It couldn’t hurt to slow drivers down, going uphill and down; I’ve frequently had to dodge drivers who take the corner too fast. And narrowing the roadway could do that. But lets hope they’ve taken the needs of the many bike riders who use that route to connect the bike lanes on San Vicente Blvd with PCH and the beachfront bike path into account, as well. Update: A comment from Mark, who lives near Entrada, says he’s been involved in the planning process, and that there will be room for bikes in both directions after the project is finished. The wife of a South Bay cyclist asks drivers to remember that the bike rider in the lane ahead of them is someone’s husband, wife or child, and thanks an LAX cop for taking it on himself to keep riders safe. The Hollywood Reporter reviews the new documentary about the Eastside’s own Ovarian Psychos Bicycle Brigade as it premiers at South by Southwest. The LACBC wants you to nominate someone to join their diversity team as a supported rider for this year’s Climate Ride. Local residents complain about the planned location of an Ojai bike park, citing the possibility of noise and yes, the loss of parking. Because cars are more important than giving kids a safe place to ride, right? A San Francisco columnist crawls inside Lance Armstrong’s brain by moderating a conversation with America’s greatest ex-Tour de France winner, and says Hamlet, Othello and Macbeth had nothing on him. A Marin columnist says the solution to Bay Area traffic congestion is to not give people any alternatives to driving, by voting against all regional measures, as well as politicians who support an admittedly expensive bikeway across the Bay Bridge. Two Sausalito woman are under arrest for a drunken hit-and-run that injured a cyclist; they stopped their minivan a few miles away to switch seats in an apparent attempt to cover up who was behind the wheel, even though police say they were both under the influence. When a writer says Portland should use it for a role model for bicycling, you know Davis is doing something right. A writer with the Frontier Group says bicycling isn’t the answer to global warming, but it can be a tool for transformation to lead cities toward the next steps in de-carbonization. Tucson cyclists are reporting near misses to collect data to improve safety. So much for that bill requiring Iowa drivers to change lanes to pass bicyclists; it died in a legislative committee, even though 70% of Iowans support the measure. A Philadelphia professor says it’s time for drivers to stop treating bicyclists like vehicles, and start treating them like they would pedestrians. Will Smith is one of us, at least in his new movie shooting now in the Big Apple. More anti-bike terrorism, as someone booby trapped an English bike path by stringing barbed wire at neck level. Welshman Geraint Thomas is the winner of this year’s Paris-Nice stage race, beating Alberto Contador by just four seconds. An 87-year old Spanish driver is under arrest for slamming his SUV into a group of cyclists without stopping, then driving on to a nearby restaurant where he finally reported the wreck. An Australian bicycling group develops a code of etiquette to encourage cyclists to ride “impeccably” so they won’t piss off motorists and pedestrians. Which of course says nothing about drivers who can’t seem to see the rider in the lane directly in front of them, let alone what can be done about it. Not even Superman uses a phone booth anymore. So Thailand is converting them to bike repair stations. Bicycle tourism is bringing benefits to the people and economy of an Indonesian island. Apparently, a bicycle makes an effective getaway vehicle if you’re going to steal an electric guitar from a Chinatown music shop. So if bike counters are triggered by the metal of a passing bike, does that mean riders on carbon and bamboo bikes don’t count? And who needs a bike rider when your e-bike can ride itself? As an Entrada resident, I have been in contact with the city since the beginning of the project, and YES having plenty of room for biking both up and down the hill is part of the plan. Thanks for the update, and for keeping on top of this project. Good to know bikes have been taken into account; then again, that’s what I’d expect from Bonin’s office. As another Entrada resident I maintain serious concerns about the safety of the plan. Any way the traffic study, and striping plan can be made available for public review? Not clear how a steep incline with a blind curve, and limited ‘shoulder’ can be narrowed without creating more dangerous conditions for vehicle and cyclists. Maybe a proper traffic study would address these concerns. Not sure if this has been done. Councilman Bonin’s is not aware of any that exist.